Now more than ever, business leaders have a heightened awareness of the risks to their organization’s sensitive data. But greater awareness by itself does not bring about actual changes to enterprise capabilities or user behaviors when dealing with sensitive information. In order to move beyond awareness and make well-informed decisions about data security, business leaders need a better appreciation of risk and the potential business impact. 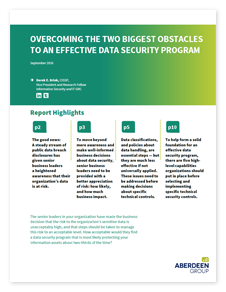 This report from Aberdeen Research delves into the biggest obstacles organizations are facing in implementing an effective data security program, and how to tackle these obstacles by ensuring that data classification and data handling policies are universally applied across the organization.